Cabin 1 - 3 bedroom w/2 queen, 2 full beds. Rate based on 6 people. Cabin 2 - 3 bedroom w/ 3 double beds. Rate based on 6 people. Cabin 3 - 2 bedroom w/ 2 queen beds. Rate based on 4 people. Cabin 4 - 2 bedroom w/ 2 double beds. Rate based on 4 people. Cabin 5 - 1 bedroom w/ 1 double bed. Rate based on 2 people. Cabin 6 - 3 bedroom w/ 3 queen beds. Rate based on 6 people. Cabin 7 - 3 bedroom w/ 4 queen beds. Rate based on 8 people. Cabin 8 - 3 bedroom w/ 3 queen beds. Rate based on 6 people. Cabin 9 - 3 bedroom w/ 3 queen beds. Rate based on 6 people. Phone reservations will be held for 14 days pending arrival of your deposit. In case of cancellation, deposit will be returned minus a $50.00 service charge ONLY if unit is re-rented at regular rate for the entire stay you booked. Early departures will be charged for the entire reservation. Prices subject to change without notice. Rates DO NOT include state or local taxes. 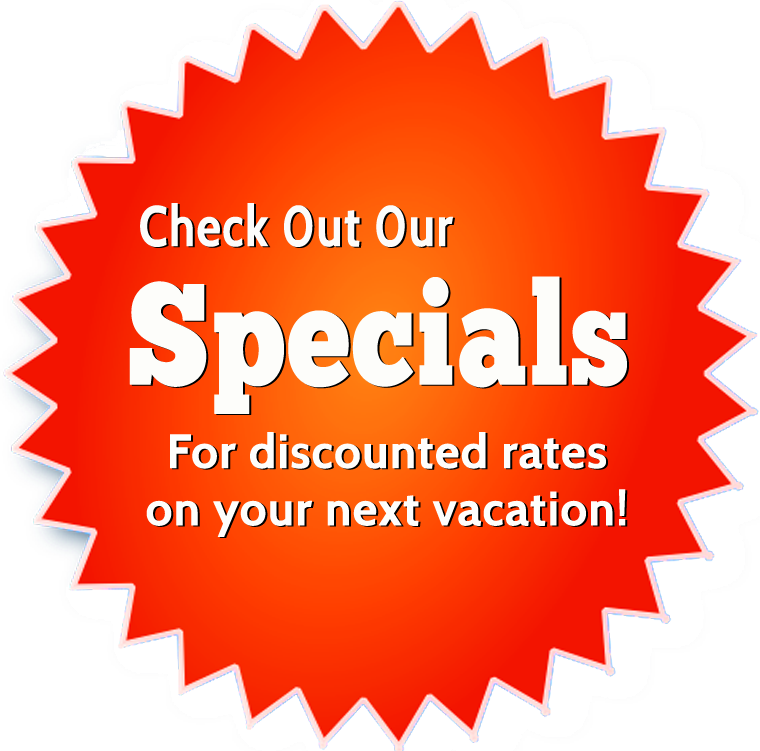 25% of weekly cabin rate or $100 for shorter stays. Please send deposit within 14 days of making your reservations with us. All of our cabins are furnished with dishes, pots and pans, bed linens, appliances, microwaves, toasters, and coffee pots. Each unit has a charcoal grill, picnic table and fire ring. We do not furnish any towels or soaps. Swimming beach, canoes, paddle boats, kayaks, playground, horseshoes, private resort boat launch, one dock slip, coin operated laundry, campground guest shower and bathroom. Game room with air hockey, arcade games, foosball table, puzzles, and assorted small toys for children - open 8:00 am to 10:00 pm daily. Pets are allowed but may not be left alone in any of the cabins. There will be a charge of $5.00/day ($35/week) added to your bill for each pet. We take pride in the cleanliness of our cabins and grounds, so all pet messes must be picked up. Pets should be on leashes at all times. All shots must be current! Rates are based on 2 adults & 2 children (under 18). Deposits will be applied to the last day of your reservation. No refund or discount for early departure. You pay for whatever you reserve. Quiet hours are 10:30 pm to 8:00 am. No children on playground or running around during quiet time. No loud parties! Pets must be leashed at all times, picked up after, and owners are responsible for any damages to personal property. Night crawlers, wax worms, and leeches are available for purchase at the lodge. Minnows may be purchased in Jenkins and Pine River.